The R. J. Toomey Company has totally redesigned their Full Cut Concelebration Alb. 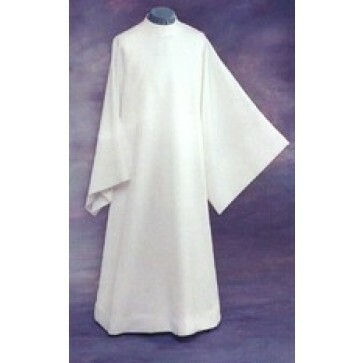 It has a higher collar, fuller sleeves, and deeper hem. Zipper closure is concealed on the shoulder. Machine washable - White Poplin 65% Polyester and 35% Cotton. Available in sizes X-Small -X-Large.